The river has risen slightly as we have had good rain in the Northern Cape. It is now a bit discoloured with visibility at 0,5 metre which is quite acceptable. Fishing continues to be good but expect the yellows to start dropping back to deeper water with the onset of cooler weather. What is very pleasing is that there appear to be lots of fingerlings around especially in the deeper water. After being very clear for the last 6 months it is now a bit discoloured. The level is slightly up on last month due to local rain. The anglers who visited last week found conditions difficult, but they still caught. 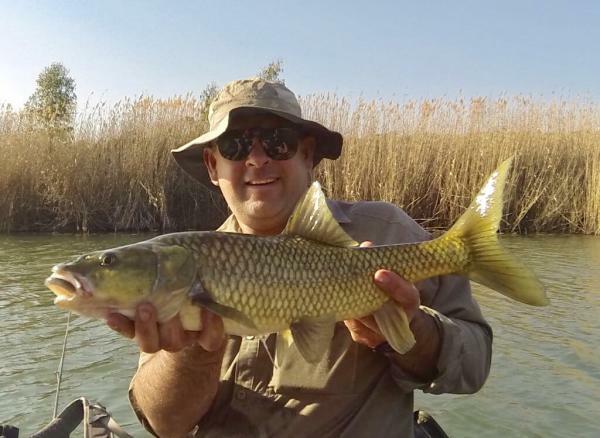 Still discoloured but continues to fish well below VDK Dam in the Hopetown area. What was noticeable last month was that they were releasing more water from the dam, probably to generate extra power.